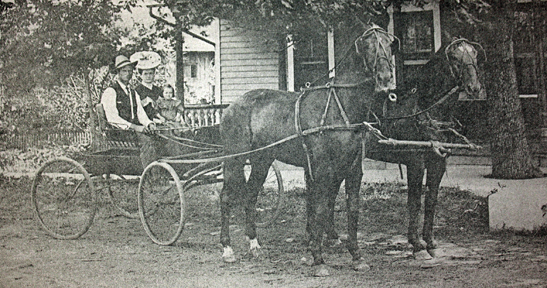 Wife of Fred E. Heldt, married December 16, 1900 in Beecher. Can you see Violet sitting on her mother’s lap in the buggy? Mr. and Mrs. S.R. Stites and Mr. and Mrs. Fred E. Heldt entertained about 50 of their married friends at a Halloween party Saturday evening. 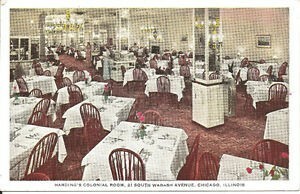 The party gathered at the home of Mrs. H. Bielfeldt at 7:30 o’clock and from there ambled around in an effort to locate where the function proper would take place. When they arrived at the Stites home, they were directed through the dimly lighted rooms, following a narrow roped passage to the basement. Before reaching their destination, however, they heard weird and hideous noises that fairly made the cold chills creep up and down their spinal columns. 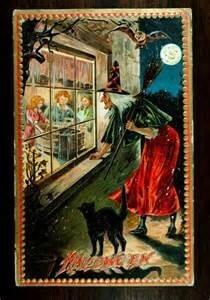 The basement was in utter darkness, but a match was brought into play and jack-o-lanterns and lighted candles soon illuminated the room, when it was found tables were set with plenty of good things to eat that would even tempt a ghost. Unique and appropriate decorations adorned the tables. 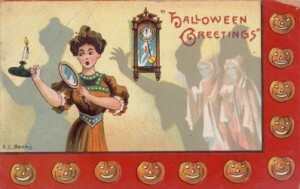 Large jack-o-lanterns were placed in the center of the tables, while at each plate there were small candles with carrots as candlesticks. Alongside of each plate were also small turnips filled with assorted candies. Even the paper napkins were adorned with a pumpkin face and a witch, appropriate to the occasion. After satisfying the inner man – at which the writer must confess we overdone it – the happy throng were escorted to the home of Mr. and Mrs. Fred E. Heldt, where they found the rooms tastily decorated with corn stalks and autumn leaves. Here games, vocal and instrumental music, dancing and general merriment prevailed and each guest seemed to enjoy an equal share of the fun. At midnight the good witch made her visit with a kettle of sparkling grape juice just to put on the finishing touch, and shortly afterward the party dispersed, regretting that it had “got late late so early.” The ladies, Mesdames Stites and Heldt, are charming entertainers and are deserving of much praise for their party on Saturday evening, which was so successfully carried out. Funeral services were held Monday at 2 p.m. at the Hack Chapel in Beecher for Mrs. Fred Heldt, 79, of 705 Woodward Street, Beecher, who died Thursday at her home following a lingering illness. 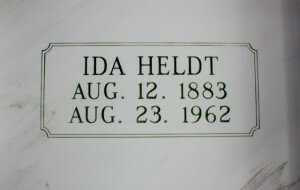 Born in 1883 in Germany, Mrs. Heldt came to the United States as a child. 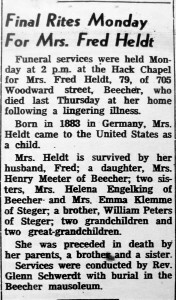 Mrs. Heldt is survived by her husband, Fred, a daughter, Mrs. Henry Meeter of Beecher; two sisters, Mrs. Helena Engelking of Beecher and Mrs. Emma Klemme of Steger; a brother, William Peters of Steger; two grandchildren, and two great-grandchildren. Services were conducted by Rev. 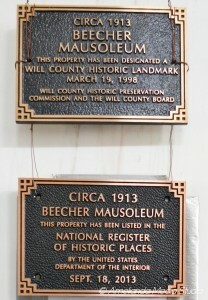 Glenn Schwerdt with burial in the Beecher Mausoleum. Cousin of husband: Henry Heldt Sr.